In 1967, Ducati launched a redesigned frame featuring twin tubes running from the back of the gas tank down to the swingarm pivot. This new frame required a wider rear engine case mount — approximately 3 inches wider than the front — and these subsequently became known as “wide case” engines. Between the two styles, narrow and wide case, the basic architecture remained the same. Ducati brought the new frame and wide case engine design to the street in 1968, first in the street-legal 350cc Scrambler, then also in 250cc and 450cc models. All of these used a bevel drive overhead cam with valve springs. During 1968, Ducati finally brought a desmo to the street with the launch of the 250 and 350 Mark 3 D — “D” for Desmo. 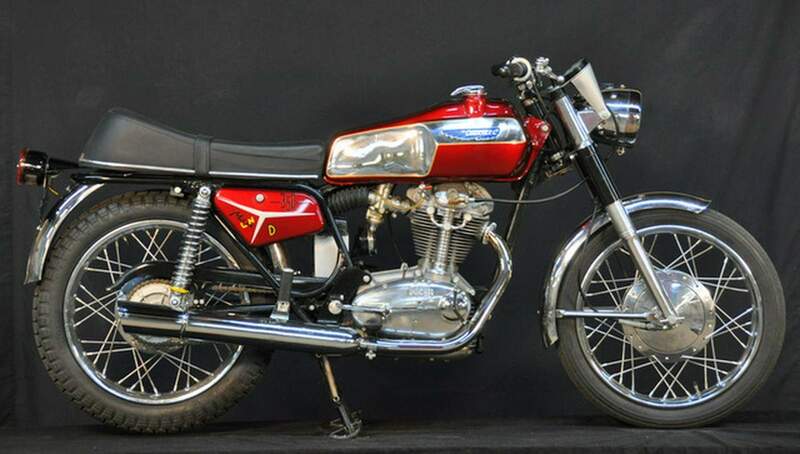 The 1968 Ducati 350 Mark 3 Desmo featured a red frame, a red and chrome gas tank with twin-filler caps, chrome fenders, steel rims, a high-lift cam and a tachometer. 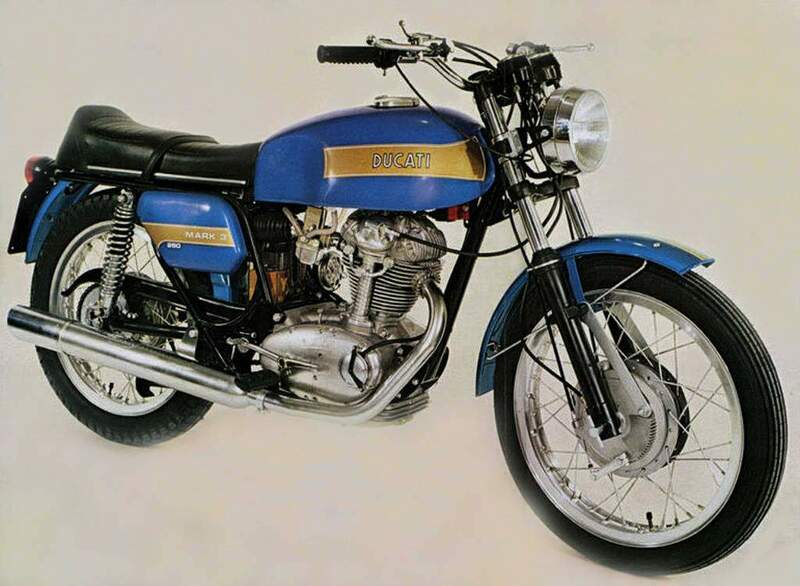 In 1969, the 250 and 350 were joined by a 450 Mark 3 Desmo, and they were outfitted with a black frame and a single-cap fuel tank and chrome fenders. Non-desmo Ducatis feature a dull silver paint in place of the chrome. 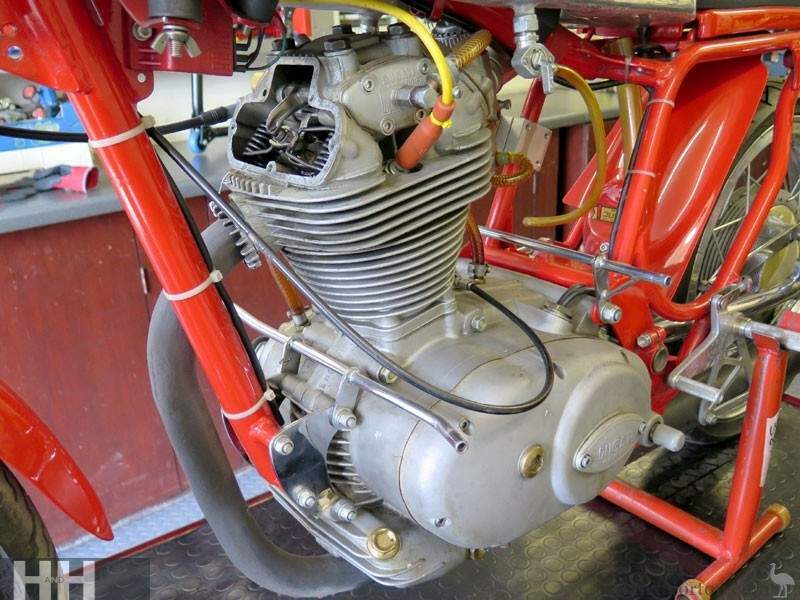 Ducati’s 350cc single-cylinder desmo engine is all alloy with polished cases and massive finning on the barrel, which features a cast iron liner. Bore and stroke are 76mm by 75mm for a capacity of 340cc, with a 10:1 compression ratio. The 5-speed unit construction gearbox has a heel/toe shifter on the right side of the engine, with the kickstarter on the left. Cycle magazine tested the Mark 3 D Ducatis, including the 250, 350 and 450 models, which, apart from engine size, are of the same overall dimensions. “The Ducati’s single-cylinder engine has narrow cases; therefore, the frame, the tank and the footpegs can all be very narrow, too. You can fit yourself more easily to a well-laid-out narrow motorcycle than you can to the fat bikes, and the result is a feeling of instant confidence … the Ducatis feel as though they had been built just for you, and that they weren’t something that came out of a crate,” Cycle said.